Glamping (glamorous camping) is a portmanteau (a word that is a combination of two or more words) and blends glamorous and camping. It's origins lye in the early 21st century when international financial troubles created demand for a high value luxury holiday style. From these troubled times the concept of a Glamping Holiday was born. Glamping is a form of camping involving accommodation and facilities more luxurious than those associated with traditional camping. Glamping is a growing global phenomenon that combines camping with the luxury and amenities of a hotel. Glamping is also know as boutique camping, luxury camping, posh camping or comfy camping. Glamping allows guests to experience camping without the hassle of finding a pitch, transporting their accommodation and equipment and erecting and dismantling their own tents. Accommodation at glampsites can include structures such as Bell tents, Yurts, Cabins and Geodesic Domes as well as tipis, pods, safari tents, vintage caravans, shepherd's huts, and treehouses. Dorset Country Holidays offers one of the most diverse ranges of Glamping in the UK. Glamping offers amenities such as fresh bed linens, tea service, food service, private dining and most importantly direct access to the great outdoors. Glamping Holidays have created a renascence for camping holidays being popular not only with the traditional camping markets of families and couples but glamping holidays have also grown in popularity for birthday parties as well as stag and hen parties across the UK. Part of the rise in glamping holidays can be attributed to the change in legislation for towing in the UK, requiring an additional test to tow a caravan which has prevented people from taking up the traditional family caravan holiday option and instead going on a glamping holiday. Glamping holidays have also been embraced by a large number of young professionals who want something different and an experience from their time off. This information on the history of glamping in the UK has been provided by the Dorset Country Holidays Glamping, the leading independent glamping site in the UK. 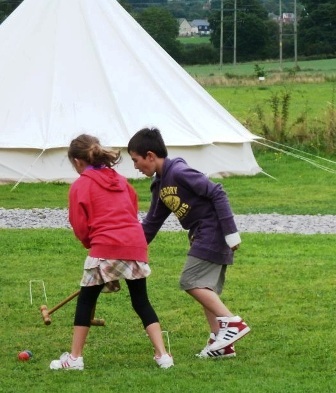 Dorset Country Holidays Glamping have been proving camping holidays for almost half a century. We are a family run business based in the heart of Thomas Hardy's rural Dorset. Dorset Country Holidays Glamping have provided glamping holidays in Dorset since 2006 making us one of the longest established glamping sites in the UK. With our level of experience we are happy speak to researchers and media regarding the Glamping Industry. Please feel free to contact us regarding glamping issues.